A bronze statue commemorates the racehorse, Bernborough. 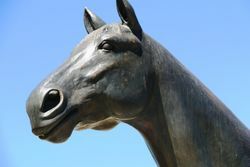 As a life size replica, it is the largest bronze statue cast in honour of a horse in the southern hemisphere. Bernborough won his first race as a two year old in 1942 on a protest. Between 1945 and 1946, of 18 starts he won 15 consecutive races carrying top weight. His permanent jockey was Athol Mulley, and his highest weight was 10 stone 10 lbs in the Doomben Cup in 1946. He fractured a sesamoid bone in his left foreleg and was sold to a United States owner for 93,000 pounds, who later sold him to Kentucky Stud for $300,000. He died in 1960 in the United States while at stud. 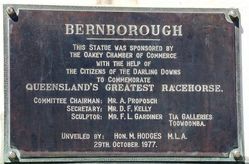 This statue was commissioned by the Oakey Chamber of Commerce with the help of the citizens of the Darling Downs to commemorate Queensland`s greatest racehorse. Sculptor : Mr. F. L. Gardiner, Tia Galleries Toowoomba. Unveiled by : Hon. M. Hodges M.L.A.